Another in a series of arcade/adventure games, Space Cutter comes from the United Kingdom, where the absolute rage seems to be 3D-modeled graphics. 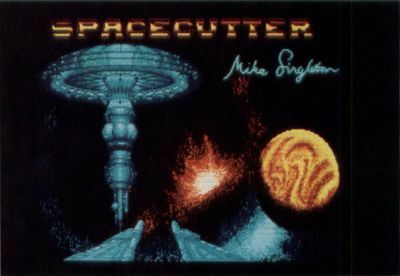 Unfortunately, Space Cutter falls short in several critical game-playing areas, and is, consequently, a far cry from other Rainbird titles such as Starglider II. The fictional background contained on the packaging is somewhat misleading. You are told that playing Space Cutter is "A daring escape to freedom." Supposedly, the premise is that you have stolen a spacecraft that no other human has ever been capable of piloting before, and that your thoughts of freedom spur you on to your quest. Never do you really make a mad dash for freedom. In fact, you take up the role of adventurer, in search of five objects scattered throughout the area of known space referred to as the "whirligig." Along the way, you battle attackers that vary from passive to downright hostile. The documentation consists of a single manual, 3 × 4 inches in size, totalling 16 pages. ST owners should appreciate the fact that their disks are not copy protected. However, it is hoped that this will not spawn a rash of illegal copying, which is still an infringement on Rainbird's copyright. The modeled graphics are indeed superb. They are colored realistically, rendering a believable three-dimensional effect. The animation is also excellent. Each of the major objects rotates a full 360 degrees and looks fine in every position. This is Space Cutter's best feature. On the other hand, while modeled in three dimensions, Space Cutter is played in only two. There is no perspective of screen depth to the game, as there is in Virus and Starglider II. The background starfield is actually many screens linked together by multidirectional scrolling. 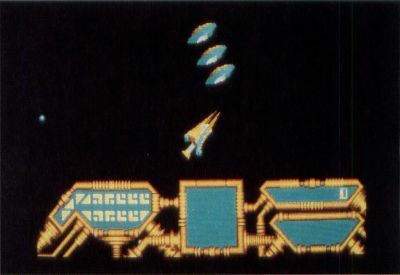 However, since expanded playfields or over-scan (popular on the 8-bit Ataris) are not supported, the player is really only viewing the starfield through a window. The unfortunate part of this is the relationship of window size compared to the size of the onscreen attackers, which are so large, they seem to be upon you before you can react. The player's ship is always centered on the screen, while the surrounding starfield scrolls in whichever direction the ship is facing. A control panel can be accessed by pressing the control key. This panel displays several important status indicators, including supplies of fuel and weapons. It also indicates what supply depots are present within the current sector of space. And finally, a radar map is displayed that indicates the positions of supply depots, star gates, and your own ship. Unfortunately, there is another major drawback here. The map does not display the positions of enemy ships! You have to guess that for yourself. Also, the position of "perfect solids," the objects you are looking for, are not shown on this map. So, you will doubtless wind up doing a fair amount of wandering. The lack of joystick control is Space Cutter's worst deficiency. Mouse control is extremely awkward; nothing like the system used in Starglider II. When asked about the possibility of adding joystick control, the technical staff at Rainbird explained that they could not put any more time into the product, without jeopardizing its price point; and they do have a point. The product's price is extremely competitive. A point in favor of Space Cutter is its mathematical modeling of known space. This allows for a tremendous number of sector configurations, and consequently, many levels of play. The documentation states that over 4 billion sectors, spanning 11 levels of progressive difficulty are possible. This does not necessarily mean that you will have to conquer each sector in order to ultimately finish the game. That would take an estimated 8,171 years of continuous play! Through the use of selected star gates, you can jump whole sections of the galaxy in search of the puzzle pieces. Since the last piece is found in Sector 33550336, the player is provided with two "road maps." Mind you, it will take a minimum of 36 jumps through star gates to reach this goal. Then, you must find the puzzle piece and haul it to a nearby star gate in order to complete the game. Unfortunately, for the arcade enthusiast, calculating the positions of objects in each new sector seemingly takes forever to accomplish. In the meantime, the player just sits and waits. When the calculations are complete, the sector map turns red, and you can then enter real space by pressing the left mouse button. Once the new sector has been calculated, though, the wait time is minimal, which means that if you lose a life, you won't have to wait for recalculations in order to get back into the heat of battle. In conclusion, Space Cutter may appeal to avid space adventure fans, but it will surely disappointment arcade purists. The awkward mouse interface must take the blame for this. 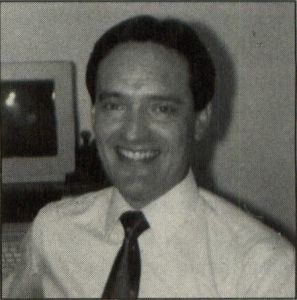 And with no game save routine, adventurers will have to devote many hours of continuous play, in order to finish the contest.